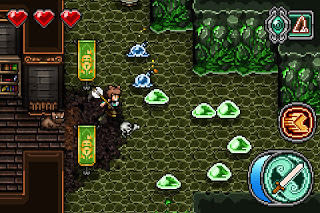 ‘Mage Gauntlet’ Review: Magic, Swords and an insane amount of hats. We at the App Shack have always been huge fans of the developers over at Rocketcat Games company because of their previous hook-slingin’ games like Hook Champ, Super Quick Hook, and Hook Worlds. Deciding to branch out from that genre of games they created Mage Gauntlet, an ARPG (Action Role Playing Game) that is built in the image of Secret of Mana. Read our interview with them here to see what new direction this studio will turn next. The backstory of Mage Gauntlet is very deep and intriguing and had me rewatching the cut scenes to make sure I understood it. Basically a great evil known as Hurgoth descends over the land causing pain and suffering. A wizard named Whitebeard conquers and sends the monster to the bleak Dark Realm. He and some appointed wizard guardians have been keeping watch on the seal to make sure that it does not get broken open. It appears that the seal is leaking out energy causing monsters to rise again in the land. I’ll let you find out the rest of the story on your own as it is best experienced without already knowing what’s going to happen! Each section of the game world is split into levels which are seamlessly integrated together much like different areas in Zelda. After you exit the level you immediately start walking through the next level without having to select it. You can earn up to 3 stars in a level. If you defeat all the enemies and dont lose any lives you get the perfect three stars for that level. You can earn a pet by doing so which is an awesome motivating factor. Also able to be obtained by beating levels are hats. 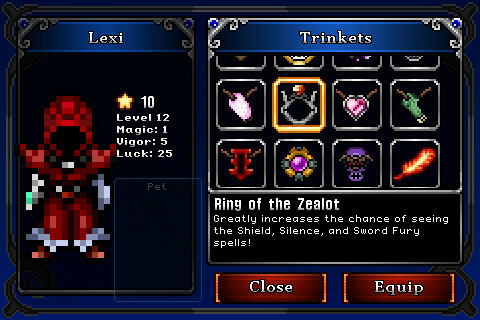 Hats have always been a recurring theme in Rocketcat Games and in Mage Gauntlet there are 110 hats to collect. These hats don’t actually boost your stats in any way but are certainly fun to wear and let you customize your character. Pets, Swords, and Robes though, do influence your stats and the possibility of spell drops. You control Lexi by using one of three control methods which are all very adaptable and easy to use for both iPod and iPad users. To attack enemies you can quickly tap the attack button for a weak attack and by holding it you can initiate her power attack which stuns all enemies it touches. Also available are spells which you can get by cracking open magic vases. 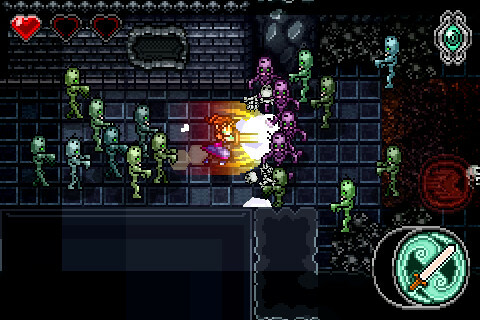 The battle system feels much like Secret of Mana’s and is quite fast paced as the enemies can get very cunning. Also there are no fetch quests at all so this really does hearken back to the 90’s era RPG’s. For added replayability they included a separate mode called Master Mode that puts new secrets and overwhelming monster numbers in the same levels you played before. You may recognize the name Rocketcat from seeing some of their previous games like Hook Champ and Super Quick Hook. Currently they are working on a RPG that goes back to the roots of classic RPG’s with no fetch quests and no grinding. Intrigued by their progress I asked them for a interview. If you have any questions you want answered by RocketCat then shoot me a tweet or leave a comment on this article. Enjoy! A: Level and gameplay design mostly, and I run the company. Q:What do you feel you gain from each succesful game publish? Do you utilize the best elements from previous games or do you just start from scratch? A: Each game teaches important lessons that we use in the next game. Even though Mage Gauntlet is a completely new genre, you’ll still be able to see the influences from previous games. Q: Regarding your recent game Mage Gauntlet, how do you feel this will alter the course of your studio. For example will you start branching out into other genres like Tactical RPG’s like Final Fantasy or revert back to the hook and jump that was loved by many? A: You’ll see us move into the action-RPG genre for awhile. 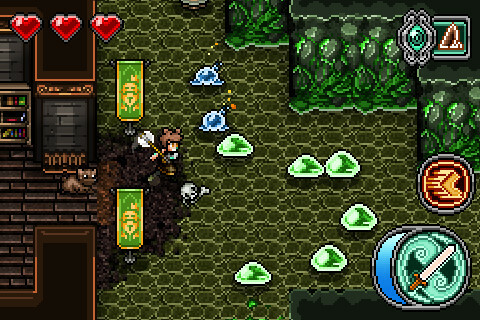 We also have been thinking about doing turn-based RPG’s, because we could easily make those using the same RPG engine. I don’t see us going back to the hook racing games anytime soon, at least for iOS. Q: Any plans for a sequel to Mage Gauntlet? A: Yes, probably two direct sequels to continue the story, and also one limited story, all action spin-off. Q: What do you feel about making a platformer with rpg elements that also incorporates the hook and jump mechanism? A: We were going to make a grappling-hook metroidvania sort of game. We stopped working on it because it just didn’t seem to fit the iOS platform too well, for a variety of reasons. We might revive that project later on, maybe as a PC game instead. Q: What kind of sales do you expect for the new game? A: No idea! If people find it and like it, it could sell a lot more than the hook games did, just because action-RPG’s are a really popular genre. Grappling-hook-racing is a much, much more niche genre in comparison. Q: How do you think people will react to the game and its spin of the RPG genre? A: I think people that like classic-styled action RPG’s, but don’t like 40 hours of KRPG style grinding, will like this game. All the top-down action RPG’s I can think of right now for iOS are Korean RPG’s, which seem to universally have a really big focus on pointless grinding. We might even be the first classic RPG to hit the App Store that doesn’t have a “collect 10 firewood” quest. Q: Can you give us details on an example of a typical quest in the game? A: There are no quests in the game, in the modern-day sense. That is, no collect 10 quests, no kill 20 quests. Instead, you’re exploring and fighting your way through the game’s story. Q: What is the main story of the game? What is your goal? A: In the game story, your quest is to find three missing wizards that are important in preventing the Archdemon from escaping his banishment. You’re given a powerful magical gauntlet to assist you. About midway through the game, it becomes clear that you have to stop the Archdemon yourself. Q: How replayable would you say the game is? Are there many collectibles and other things you can find after the story? A: There are a lot of secrets, collectibles, new swords and other equipment you can find, and achievements. There’s also a nightmare difficulty mode, with remixed levels and enemies, that you unlock by beating the game. For completionists, there’s a star-grade system for each level which unlocks pets that follow you around, and an optional kill-enemies-for-rare-hats bit. Q: How does it feel to be manager of a game company? Are you stressed out all the time trying to get your games to the next level or is it fairly laid back? A: The last month of development for each game is pretty stressful. Otherwise it’s not, really. When do you estimate the games release date? Q: When do you expect the game to release?